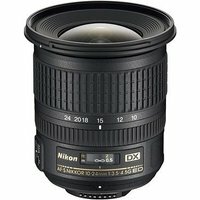 The Nikon 10-24mm f3.5-4.5 G AF-S DX Lens is an ultra wide-angle 2.4x zoom lens with 109° to 61° field of view which is the equivalent to 15-36mm in 35mm format. Designed for use with DX-format digital SLRs, the high quality optical design boasts three aspherical and two ED glass elements to deliver images with outstanding resolution, contrast and minimized distortion. This lens is ideal for capturing landscapes, images with exaggerated perspectives and for shooting in tight spaces, it also comes with Nikon's exclusive Silent Wave Motor for smooth, quiet autofocus with all Nikon DX-format cameras.